Cannabis and Anxiety are often portrayed as having a complicated relationship. Despite this, given the right strain, it doesn't mean that cannabis can't be used to actually help manage this condition. Anxiety and the symptoms it brings; worry, panic, and stress have affected us all at some point. All be it the little things like getting nervous before a presentation at work all the way up to stress and panic about leaving your home. Anxiety is complex and often irrational, making it at times incredibly difficult to combat. There is no one size fits all approach as not only do people's levels of anxiety vary but the remedy for such symptoms does as well. Not sure how well people would take to listening to instrumental movie soundtracks like I do to help settle my nerves! Throw cannabis into the equation and that relationship can get somewhat more complicated. It is important to point out that complicated doesn't necessary mean that it impacts anxiety sufferers negatively, as is often the perception given by mainstream media. Complicated means that just as every anxiety sufferer is individual and the approach to dealing with that anxiety is equally unique, cannabis and its use to easing anxiety is also a tailor-made remedy. Scientific studies have gone some way to clearing the haze that surrounds this topic. A study conducted in 2009 found that whilst cannabis users were more likely to have anxiety like symptoms, it was actually a case that anxiety sufferers were turning to cannabis as a means of self-medication. So what is it about “cannabis” that often has people divided? The simple fact that cannabis is no longer just “cannabis”. The generalization that all cannabis has the same effects is often what leads to this one brush approach. Times have moved forward and as such so has our understanding of what components make up cannabis, as well as how this versatile plant can be tailored for the desired effect. The make-up of cannabis and the cannabinoids within it are the biggest benefactor in what feelings or reactions different people have when consuming cannabis. THC is often regarded as the primary cannabinoid and what gives cannabis its illegal and psychoactive properties. It is also this same THC that can contribute to feelings of anxiety as a result of the way it makes the receptors in our brain go into overdrive, often stereotyped as the paranoia that comes with weed. Now that's not to say all THC strains will lead to paranoia, buts it is important to consider which strain of cannabis is best when dealing with anxiety. Just like the complicated nature of each individual's anxiety, the right strain will be different for every user! WHICH CANNABIS STRAIN TO CHOOSE? The following three strains are three that we think cover most bases when using cannabis as a means of managing anxiety. It is impossible to say how you will react when consuming cannabis but understanding the different effects that can be obtained will help you to make an educated and informed judgement. Finally, starting with a low THC and/or high CBD strain is more than likely the best place for most anxiety sufferers. CBD is a non-psychoactive compound that can help combat anxiety with attributes such as a clearer head and a stronger feeling of calm. Kicking things off you couldn't get a more apt name. Whilst primarily a sativa dominant strain, it still possesses a strong indica pairing. Sativa strains typically uplift and energise the user which can be detrimental when trying to calm oneself. Stress killer mixes the best of both worlds. 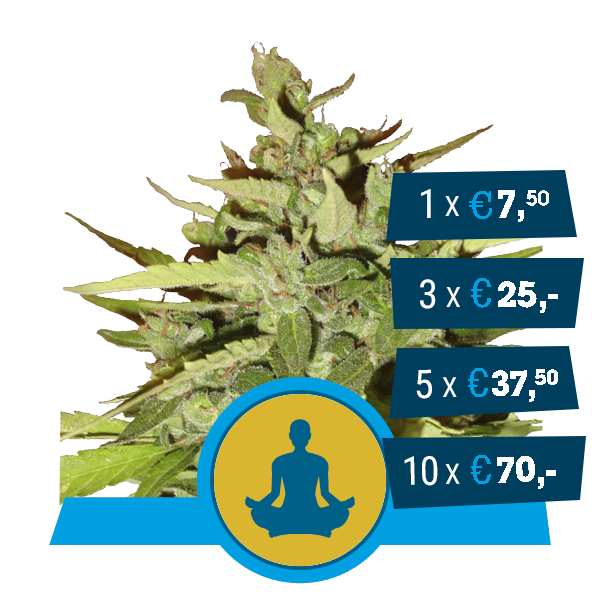 It has a THC content of 11%, whilst also being high in CBD to provide that clear head high. Bursting with citrusy flavours, this is a surefire strain to kick start your day. Named after a tireless cannabis activist, Jack Herer. Royal Jack, whilst still slightly sativa dominant is a more balanced strain. Because of the higher indica DNA, it gives a slightly more body stoned feeling to help when that anxiety starts to build and you need some time to yourself. Despite this, a medium CBD content still helps to keep things clear so you can think with renewed clarity. Being an indica dominant hybrid, this strain is very much an end of the day affair. 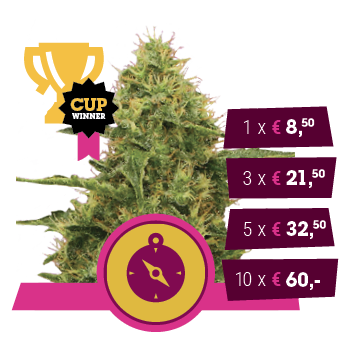 Boasting some award-winning genetics is provides a strong stone able to couchlock the user whilst they enjoy the high. Perfect for when some contemplation time is needed or for when the days events can become too much. Providing a medium strength of CBD it also has the highest THC content of all three strains. Finally, this list is by no means exhaustive. As every person is unique so is your choice in weed, so experiment until you find the right strain for you. The key is to get a feel for the high before you commit to a lengthy session. Typically smoking or vaping allow you to control the high a lot more than dabs or edibles, so these methods of consumption are recommended.